Beautyberry, Callicarpa americana, is a native shrub in the Verbenaceae family. Its name comes from the Greek calli for ‘beautiful’ and carpa for ‘fruit’. Other common names include French mulberry, Bermuda mulberry, foxberry, and turkeyberry. The common name ‘French mulberry’ comes from eighteenth century English. The English settlers in the New World despised their French counterparts and named this berry, which they found bland and unpalatable, after them. 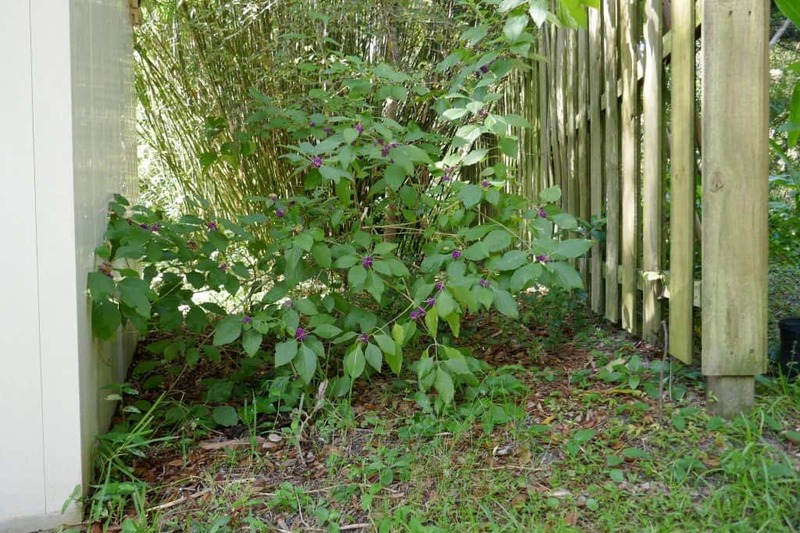 Beautyberry can be found growing in woodlands, pinelands, and thickets from Virginia to Arkansas south to Florida. It also occurs in Bermuda, Cuba, and Mexico. It is generally overlooked as a landscape plant, however, when used it adds color and texture to the landscape, as well as food for wildlife. Both novice and expert gardener will be rewarded by its resilience and beauty. Individuals grow to approximately 8 feet in height, and almost as wide, with an open branching habit. The leaves are deciduous, opposite, simple, elliptic in shape, and have finely toothed margins. A covering of hair gives young stems and the undersides of leaves a white appearance. Each hair contains an oil gland that gives the plant its distinctive odor. Small pink flowers are found in axillary clusters, in whorls around the stem, and appear in the spring and summer providing food for pollinators. The nectar is an important part of the diet of many bee and wasp species, and their attraction creates rich foraging areas for insect eating birds and reptiles. The berries, which are only a quarter of an inch wide, are a beautiful magenta color and are quite striking in winter when the otherwise obscuring leaves have fallen from the plants. There is also a naturally occurring white fruited form which looks beautiful inter-planted with the magenta form, (white forms can be seen in the Torreya and Highlands Hammock State Parks). The berries are not only incredible to look at, but they also provide an important winter food source for wildlife. Wild turkeys, bluebirds, robins, yellow bellied sapsuckers, myrtle warblers, cardinals, catbirds, mockingbirds, brown thrashers, quail, towhees, and many other birds rely on the berries as an energy source. Mockingbirds may establish a territory around specific plants and not allow other birds to feed there, possibly fooling the property owner into believing that the berries are not a desirable food source. Additionally, the berries provide a food for mammals such as raccoons and gray squirrels during the lean times of winter. Although bland, the berries are edible and can be used to make a pale, tasty jelly. The taste is reminiscent of the fragrance of the crushed leaves and fruit – a very unique floral flavor. The roots and leaves were used medicinally by American Indians to make a tea for use in sweat baths to treat fever, rheumatism, and malaria. Root tea was also used for treating dysentery and colic. 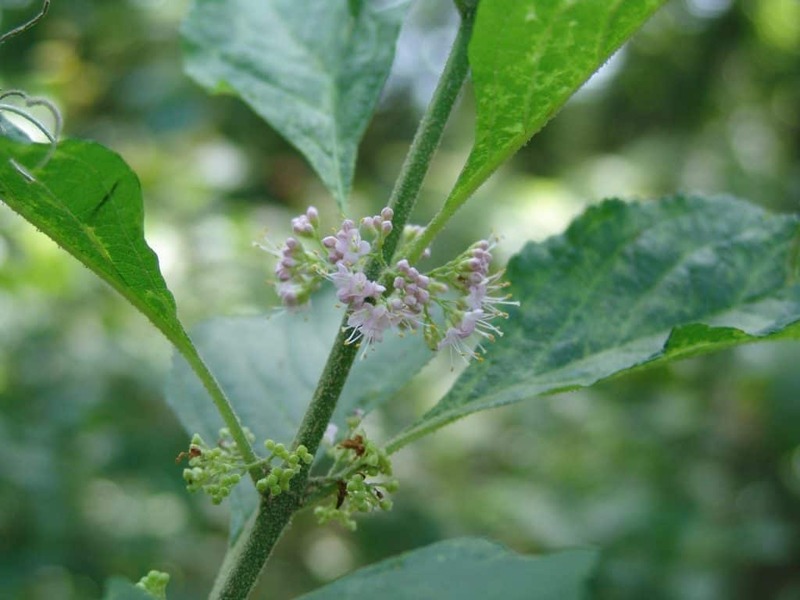 In the South root and berry tea was used for dropsy (accumulation of diluted lymph in the body tissues) and as a ‘blood purifier’ in treating skin diseases. 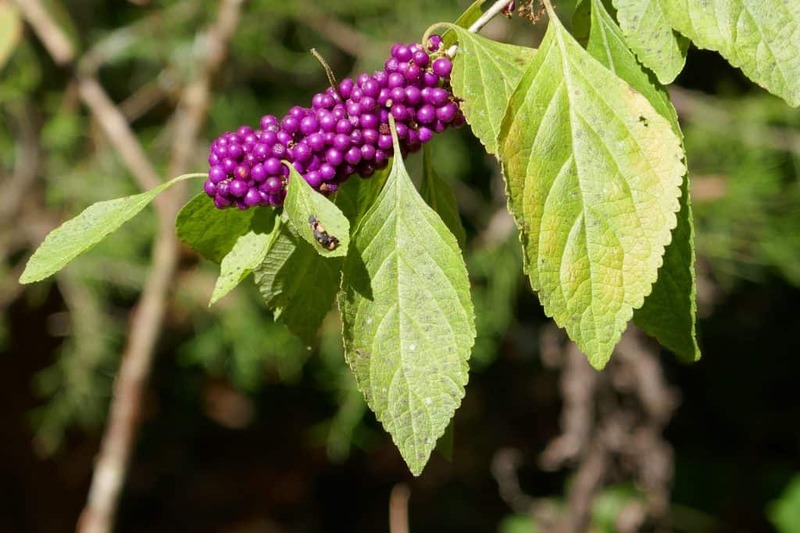 Plant your beautyberry in full sun to part shade with dry to moist soils. Once established it is virtually maintenance free. Pruning is not necessary even after a frost, but pruning close to the ground each year will generally keep the plant more compact – approximately four feet high by four feet wide. 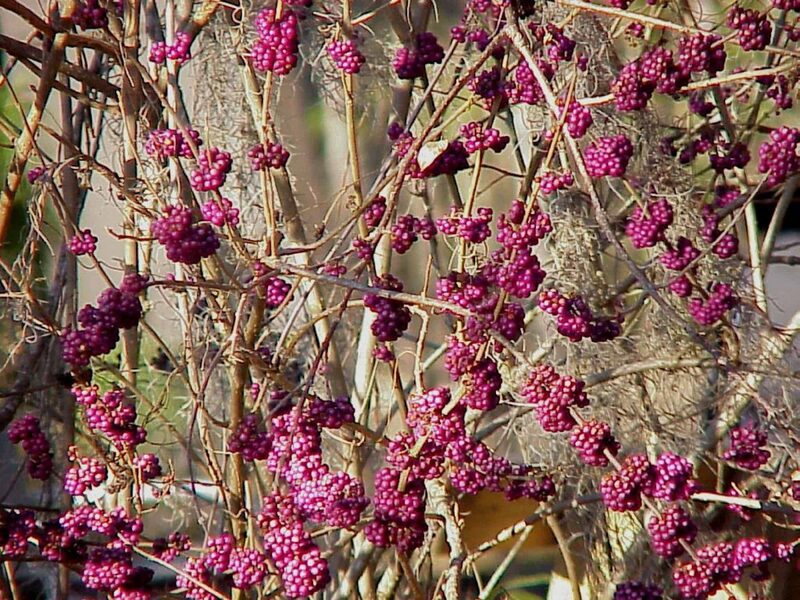 Growing in a wide variety of light and soil conditions, beautyberry, Callicarpa americana, is a welcome addition to the home landscape, and the local wildlife will greatly appreciate this additional winter food source. This is by far the easiest plant to transplant … just be sure to remove any flowers or berries to allow the plant to recover more quickly. Propagation is also achieved with cuttings and seeds. Cuttings should be kept moist while transplants should be watered regularly until they become established. Propagation can also be achieved with ripened seeds that have been cleaned and stored at room temperature until the next growing season. Each fruit contains four seeds; fresh seeds can take as long as three months to germinate. Buy beautyberry seeds here at my eBay store.